Welcome to the Meg’s Garden Design Team Blog Hop! We are circling the globe this weekend. Adriana, Heather, Chantal & Denise. After a long hop across the ocean to South Africa we visit Evgenia. Then North to Sylvie in France, Lill in Sweden, & Elena in Belarus. Another log hop across another ocean to Canada where we pop in to Stephanie & Vicky. Back downunder again to Sandrine in Queensland, Shell in Victoria, then to Victor Harbor to blog at Gayle’s in South Australia & then up the hill back to Meg’s Garden. How many time zones was that?? Each blog hop will have an Eye Candy especially chosen by that blogger from Meg’s Garden! and also on that Design Team member’s blog. Meg’s Garden is also giving away one goodies package to one lucky winner chosen from those who survived the oceans, desert & maybe some snow! What will it be?? Posting at the start of the blog hop. become of follower of those blogs and leave a comment. and leave us a comment letting us know how much fun you had! There are lots of goodies to win and you won’t want to miss out on one. The blog hop is, of course, 0pen to international entries. The hop will start on 30th November, 2012 at 5pm & you have until Monday 3rd December, 2012 at 5pm SA time (Central Summer Time South Australia) to complete the hop. The winner will be announced on the Meg’s Garden blog on 5th December (Meg’s birthday). Blog candy give-away YOU could be the lucky winner !! Mini papers/Cardmaker pack, Musical Christmas papers. Each pack also includes a piece with pics of the papers in the pack. Ribbon, white paper flowers, and Collage papers . Lovely goodies, and *blushing* at your kind words! So far a fun blog hop and your eye candy give away looks so pretty! Thank you . Great bloghop. Beautiful. Hi Heather! Pure yummy eye candy!!! Ohhhhh I am loving that vintage Christmas paper!!! LOVE IT!!! Who couldn't use some more Christmas papers?! It's that time of year ;)~ thanks for the chance, Heather~! Thank you for a chance to win this candy! Just love this blog hop! 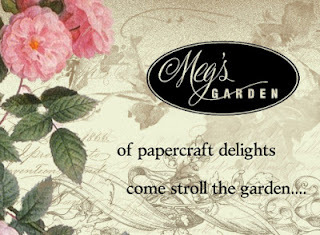 The Meg's garden papers are so so gorgeous! Очень рада познакомиться! Спасибо за шанс выиграть! This is such a lovely giveaway! Thank you for the chance to win. Love the blog candy, would be great for Christmas !!! what a beautiful candy! Thanks for the chance, Heather! Another lovely blog candy! I'm a follower and must say your works are stunning! Beautiful Christmas candy! Thanks for the chance to win! Первый раз участвую в блог хопе. Очень интересно!